← Why Bother Forecasting the Weather? Cathy and I were in need of an adventure yesterday – just one day of something unique. We decided that the South Canol Road would fit the bill nicely – a truly unique drive that few people ever do. So yesterday morning, with the temperature sitting at 0°C (32°F) but with a forecast for warm sunshine all day, we loaded the Outback and by 8:00 we were headed east on the Alaska Highway. Nearing the Yukon River bridge, we got into a fairly heavy fog that had formed over the river. At 9:20 we made a short stop at the Canol Road rest area, Km 0. Back in late May I came out here on my motorcycle and had a good look around. It’s an excellent stop even for people who are staying on the Alaska Highway. These signs are among several that warn people that this road isn’t for everyone – it’s a narrow winding gravel/dirt road for 226 km, with no services and several one-lane bridges. At 9:36 I thought that we may have to change our plans. When I got out to have a look at these trees that had fallen across the road, I heard another cracking, ready to come down, and had Cathy back the car further away. I hoped that I might be away to swing the trees far enough to clear a path, but no luck – they were too large. Just a few hundred feet further up the road was the Breath of Wilderness bed and breakfast, so I walked up, knocked on the door and asked if I could borrow a chainsaw to clear the road. The owner went to his garage and got his chainsaw, then his gorgeous malamute Kona joined me for the walk back. Between the 3 of us ( 🙂 ) we soon had the road cleared and Cathy and I continued on our way. The B&B is as lovely as the owner and his dog are friendly, if any of you are looking for a bit of a wilderness getaway. The southern section of the Canol winds around and through a series of small, pleasant valleys. This photo was shot at 10:10, at about Km 21. At about Km 29 a very steep hill offers wonderful views to the north as you drop down from the Big Salmon Range of mountains. The road was wet – very wet in places – due to recent heavy rains, but not enough to cause any real driving problems (it’s been an extremely wet summer). That speed limit sign shouldn’t be taken seriously – it may seem to indicate that you can do 60 kmh but regardless of what you’re driving you won’t see a number that high on your speedometer very often. The signs that drivers do need to pay attention to are the frequent ones that simply say “Keep Right”. Lines of sight are very short on most of the road, and it’s always very narrow. Coming up to the one-lane Bailey bridge over Evelyn Creek, Km 43.4. Evelyn Creek was a pleasant place to stop for a few minutes to run the dogs. In almost an hour and a half we had only met one other vehicle on the road. The views of Sidney Lake at Km 49 are quite limited, and we didn’t drive down to it this time. Coyote Creek is at the bottom of this little valley that we came to at 11:10. The day-use area on the Nisutlin River is 0.6 km off the main road. The Nisutlin is a particularly beautiful river – from this point to Nisutlin Bay at Teslin is about a 6-day paddle. We saw 3 canoes coming down the river towards us – they would have flown their boats in to the McNeil River and started from there. Quiet Lake is large and beautiful, but the main campground at Km 77 had nobody in any of the 20 sites. One man and his dog were down on the shore – he was out to do an angling survey but there were no anglers to talk to, so he was just scanning the distant shores with a spotting scope. Just about the time we were ready to leave anyway, drops of rain from this storm we’d been watching started to fall on us. Eight km further down the lake, we went into the Quiet Lake North campground for a look. The main Quiet Lake campground has no sites right on the water – this one does but the sites have no separation, it’s just one big gravel parking lot. For years we’ve been discussing getting an RV, and this drive would be so perfect for a little motorhome and at least 3 days to explore. The next stop was at the Quiet Lake grader station at Km 99 (formerly called 60 Mile). There’s an interpretive sign about Canol construction equipment as well as this old dump truck, a pull grader of similar vintage, and buried in long grass, a section of the Canol pipeline. We so badly wanted so slow down, but it was either have a quick look at the South Canol or none at all. At 12:50 we stopped at the first crossing of the crystal-clear Rose River (on a one-lane Bailey bridge) and chatted with a couple from Ontario who are on a summer-long wander in their camper truck. The Rose River quickly shrinks in size – this is it at about Km 112. The second of many crossings of the Rose River, at Km 140. The culvert installation here is interesting, with 3 massive culverts to handle any flow, and smaller culverts up high so that in the Spring when water flows over the ice, it can go through these unfrozen culverts. At about Km 152-157 is a spectacular valley surrounded by high peaks. The road wanders around and over many kames, huge piles of gravel left by glaciers, giving the entire scene quite a chaotic look. We stopped in that valley for quite a while, completely enthralled by the place. To me this is the Canol Road, and perhaps the Yukon, at its finest. I don’t know what causes the colour of the water in this tiny lake, but it appears from a distance to be a bloom of some sort and we didn’t have time to climb down for a closer look (it was now 2:27). At Km 169.3 there’s supposed to be a hiking trail to Ian H. Thomson Falls. There’s a sign and I could hear a waterfall but I saw no evidence of a trail (and it was raining too hard to go for a hike anyway). As we drove further north, what had been showers became more consistent. This was shot at 3:00pm. Boulder Creek was so postcard-perfect that I made a difficult U-turn on the narrow road to go back for a photo, but it just didn’t come across. I think I know the angle that would have worked but the rain reduced the importance of that shot to approximately zero. The particularly narrow road and steep drop-offs (with no guardrails) for several miles around Km 195 made Cathy very nervous but the views are superb. Looking back to the south from the spot above. The terrain goes through some dramatic changes. This was shot at 3:40 at about Km 200. Although the rain stopped for quite a while, one of the mudholes was very bad, making me happy that I had AWD. A forest fire that went through this area several years ago makes the geologic history easier to see. My guess is that this valley was carved out by a huge river formed when the last glaciers were melting away. …but it goes over Lapie River Canyon – definitely worth a stop! And a hike if you have time. Twenty miles later, we reached the end of the South Canol, where it meets the Campbell Highway that runs between Watson Lake and Carmacks. My initial plan was to just head straight for Carmacks, but I got side-tracked by another canyon section of the Lapie River. There’s a campground at the head of this canyon, so we made that side trip and walked down the river to a good view of it. Cathy commented that she’d like to see if anything had changed since her last visit to Ross River about 10 years ago. Always ready to detour, I turned around and went back, thinking that was as good a place to fuel up as any. 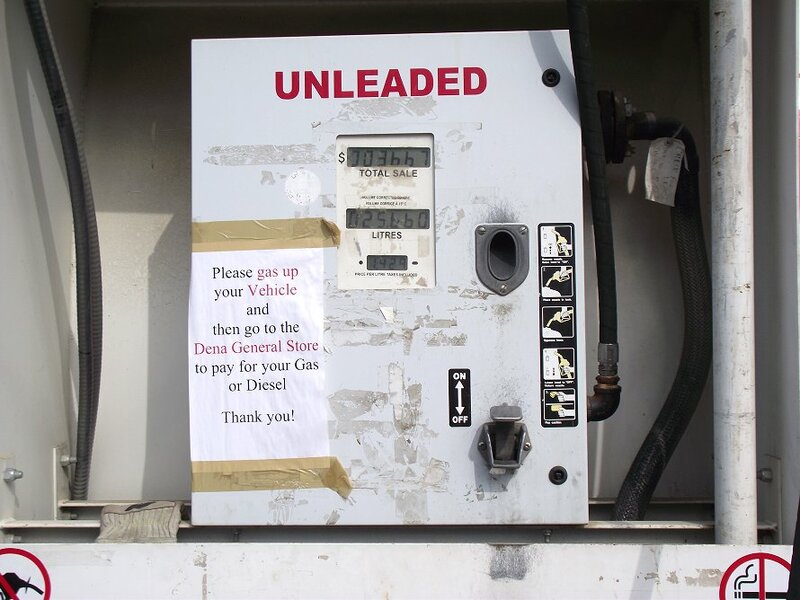 Although large signs on the Campbell state that this is a 24-hour fuel stop, it isn’t anymore – you fuel up here and then go to the general store to pay (when they’re open). The price wasn’t bad, at $1.429 per liter. This photo was shot at 4:52 pm. The village of Ross River is mostly a wreck. I drove the regular bus-and-mail service between Whitehorse and Ross back in the early ’90s and it was rough then but it’s much worse now. Although a friend of mine stayed overnight at the Welcome Inn last week, I’ll pass on that adventure. I would, though, like to get my car on the Pelly River Barge some day and explore the North Canol Road! We finally decided that we really did need to get home, but this massive landslide along Little Salmon Lake demanded just one more stop 🙂 Called the Magundy River landslide, it occurred in August 2008 as a result of melting permafrost, and is described in several professional papers and related Web sites. Okay, one more photo stop! This is the Yukon River with Eagle Rock overlooking it. That’s the location where the sternwheeler Columbian blew up in 1906 when a crew member shooting ducks hit a barrel of blasting powder instead. Very Nice ! I have never driven the Canol, would a two wheel drive pick up with a truck camper be ok on that road ? Yes, Bruce, your rig would be great for the South Canol. The gas station is 24-hours, as billed. When the store is open you pay at the store. When the store is closed, you pay by card. Enjoyed your photo journal of your South Canol tour. I did that trip about 30 years ago on Discovery Day weekend with a group of crazy Yukoners towing a 19 foot travel trailer behind a Mark IV Lincoln Continental. We had the same kind of mixed weather you encountered. The spectacular scenery brought back lots of memories. Regarding the Columbian diasaster, I believe that the shooter was the young son of the riverboat captain who was attempting to plink at ducks on the Yukon River. The lad missed his target and hit the powder kegs stored on the upper deck, killing himself and several other crew members in the resulting explosion and fire that consumed the boat.